I am from Iowa and what do you think of when you think of Iowa? Corn! 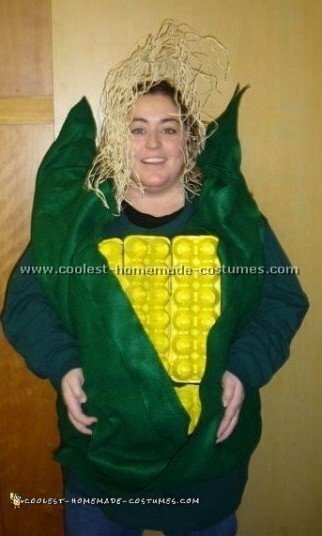 I was going to a costume party at my sister’s in Minneapolis and thought of a few ideas for Halloween costumes but this corn costume was a unique idea. First of all I got four egg carton bottoms and spray painted them a bright yellow. (We had a lot of deviled eggs at our house for a while). I used Velcro to attach them strategically on a green shirt. Next I took two yards of green felt and cut it in half and then folded them again and glued them. I sewed parts to the shirt to hold everything together. The bottom of the felt and parts of the side were used to hold the "stalks" up. I also used green pipe cleaners in the back of the green felt on top to be able to bend and position the stalks properly. For the corn silk on top I used raffia and a headband. I also used a couple of tan pipe cleaners to hold it up higher. I wrapped the raffia around the headband and then up the raffia a little to get to stand up as well. I had a lot of fun making this costume and won best costume at her party. I also heard a lot of "corny" jokes. Can’t wait for next year!